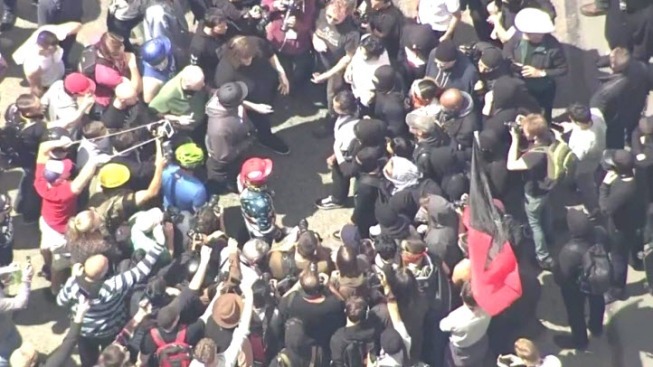 NBC Bay Area's SkyRanger on Saturday captured people burning flags and others punching each other and using helmets and skateboards as weapons. Demonstrators were also seen tipping over a garbage can and igniting its contents in Berkeley. A man who punched a woman during a "Patriots Day" rally in Berkeley Saturday has been identified as Nathan Damigo, the founder of a student-oriented white-nationalist group based in California. The Southern Poverty Law Center lists "Identity Evropa" among "active white nationalist hate groups," and one of several that have been trying to make inroads on college campuses. This video contains graphic images. Viewer discretion is advised. Damigo, a student at Cal State Stanislaus, has also branded himself as a follower of identitarianism, a European-based far-right movement focused on rejecting multiculturalism, according to the SPLC. The LA Times profiled the 30-year-old Damigo in 2016 as a young white supremacist trying to convert his fellow college students. He's a former Marine corporal and Iraq war veteran who was convicted of armed robbery. Violent clashes broke out between supporters and detractors of President Donald Trump during rival demonstrations at Civic Center park in Berkeley Saturday. Video of Damigo punching a female protester drew attention online, with many calling for his arrest and expulsion from Cal State. Actor Chris Evans, best known for his role as Marvel's superhero Captain America, tweeted the video, saying: "I hope I run into Nathan." California State University President Ellen Junn said in a statement Monday that the university will take all legal and disciplinary measures to make sure her school's students are safe. "The campus received communications last night regarding a serious incident possibly involving one of our students and very troubling actions that may have taken place at a demonstration in Berkeley on Saturday, April 15th," Junn said in her statement. "The university takes these allegations seriously, and as president, I have initiated an immediate investigation on campus to verify and confirm details of this incident." Junn stressed that the university "has zero tolerance for the use of violence and we will take all of the necessary legal and disciplinary measures to ensure that all students and everyone on campus have a safe and secure environment." She added: "While this incident understandably raises many negative emotions and calls for urgent actions, we must also hold true to our American system and principles of justice and due process." NBC Bay Area attempted to contact Damigo for comment but has not received a statement at this time. At least 11 people were injured and 20 people were arrested during the demonstrations, police said. Those arrested ranged in age from 17 to 51 years old and most are from the the San Francisco Bay, though only four are from Berkeley, according to police. Two of those arrested are from Southern California. The charges they face include battery, resisting arrest, assault with a deadly weapon, vandalism and inciting a riot, according to police.